Thousands of donors and volunteers helped United Way surpass their LIVE UNITED 2020 goals four years in advance. The following content is created in consultation with United Way of Metro Chicago. It does not reflect the work or opinions of NBC Chicago's editorial staff. To learn more about United Way of Metro Chicago, visit LIVEUNITEDchicago.org. When people aren’t meeting the basic human needs of food, shelter and safety, they can’t focus on their future life goals. When too many people are struggling, an entire community can come apart at the seams. But tending to and fixing those needs — however important — can sometimes be a stop gap measure, an immediate solution to a dire situation that doesn’t fully address the wider issues causing the problems at hand. That’s why in 2011, United Way of Metro Chicago developed a 10-year plan called LIVE UNITED 2020 to address community needs critical to improving people’s lives in the areas of education, financial stability and health. The goals were big and bold, but thanks to the hard work of partner agencies, community leaders, board members, staff and thousands of donors and volunteers, United Way was able to surpass those goals a full four years early. And they did it all while still providing basic needs support across the Chicago region. After her husband passed away from Multiple Myeloma, Caroline’s world was shattered. She was forced to sell their family home and struggled to care for her two sons, one of whom has Down Syndrome. But with the help of the Center for Economic Progress, a United Way agency partner, Caroline was able to obtain a tax refund, secure housing benefits for her son and get an educational loan to earn a degree in medical transcription. Getting caught up in the wrong crowd led to Michael dropping out of high school and dealing cocaine. Later, he committed to mending his ways, gave up pushing drugs, sold his possessions and aimed for a fresh start. But having a criminal record instead of a diploma made it difficult to find work. That’s when The Cara Program (TCP) — a United Way partner — stepped in. Working with one of their Professional Development Specialists, Michael developed a resume, honed his interview skills and participated in a professional office cleaning training program. Today, Michael — now a father of six — is a full-time employee who has been promoted twice in just 10 months, and hopes to go back to school to earn a Doctorate degree in Theology. Following her miscarriage of twins, Luz was left depressed and in chronic pain. To make matter worse, she was having trouble accessing healthcare and finding the right doctor to treat her condition. Thankfully, help was not far. Luz turned to the Palatine Opportunity Center (POC), a United Way partner agency that was able to help her find the appropriate doctors to diagnose and treat her medical condition. Fully recovered from the trauma, Luz gave birth to a beautiful baby daughter and now works at the POC, where she teaches new mothers about parenting skills and how to provide the best care for their children. Strong households, family well being, neighborhood stability and regional strength are inextricably linked together. 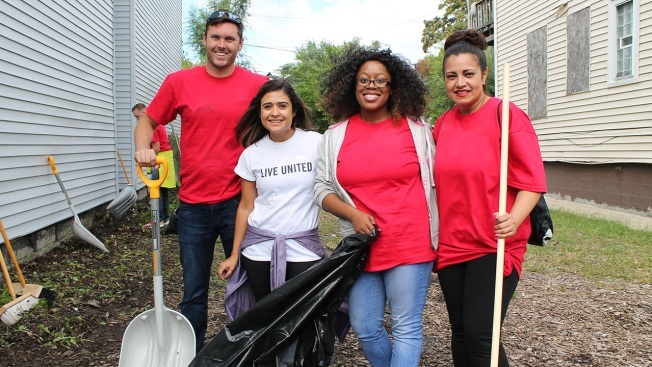 Having surpassed the goals of LIVE UNITED 2020, United Way is now approaching the complex problems in the Chicago region by building on the assets of our city and suburban neighborhoods with a new impact plan: Stronger Neighborhoods for a Stronger Chicago Region. By bringing together resources that support neighborhood leaders, residents and organizations, this ambitious new plan will create thriving communities for all of us. But they need YOUR help. Join the fight for a stronger Chicago region by donating to United Way of Metro Chicago. Your gift will help transform individual lives and strengthen entire neighborhoods. United, we can build a stronger Chicago region.